Commission Regulation (EU) No 1178/2011 (2) lays down the technical and administrative procedures related to civil aviation aircrew. Some Member States have found that certain requirements of Regulation (EU) No 1178/2011 place an undue and disproportionate administrative or economic burden on themselves or on stakeholders and have requested derogations from certain requirements in accordance with Article 14(6) of Regulation (EC) No 216/2008. The derogation requests have been analysed by the European Aviation Safety Agency, which in turn have resulted in a recommendation to the Commission to adopt certain derogations. A number of editorial errors leading to unintended implementation difficulties have also been identified in Commission Regulation (EU) No 1178/2011 by Member States. Therefore, the existing requirements should be amended in order to introduce the derogations that have a clear rulemaking effect and to correct editorial errors. 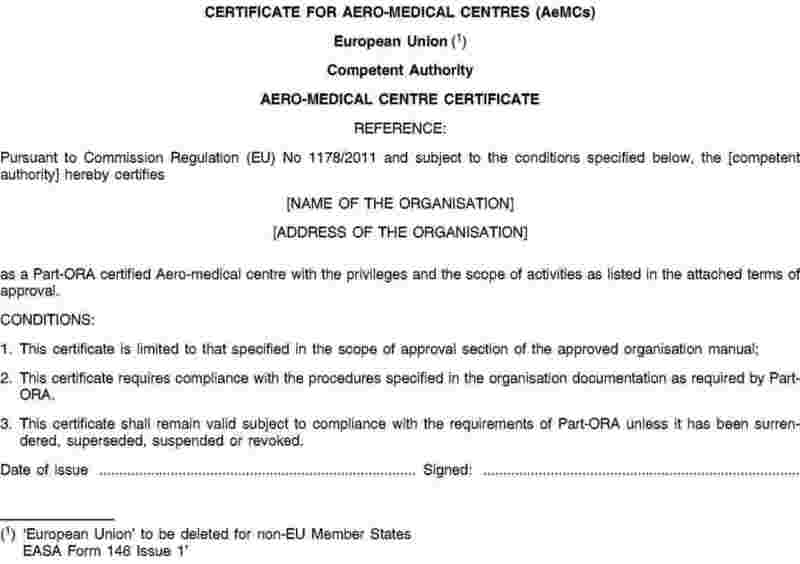 Further, Commission Regulation (EU) No 1178/2011 contains in Annex I (Part-FCL) requirements for training and checking towards an instrument rating (IR). These requirements for the IR were based on the former JAR-FCL requirements, and a need for their review has been identified. Therefore, additional requirements for the qualification to fly in instrument meteorological conditions and specific requirements for sailplane cloud flying operations should be introduced. In order to ensure that instrument training or experience gained before the application of this Regulation may be taken into account for the purpose of obtaining these ratings, the conditions for crediting this training, or the instrument experience gained should be laid down. It should be possible for Member States to give credit for the instrument experience of a third-country rating holder if a level of safety equivalent to that specified by Regulation (EC) No 216/2008 can be guaranteed. Conditions for recognising this experience should also be laid down. In order to ensure a smooth transition and a high uniform level of civil aviation safety in the European Union, implementing measures should reflect the state of the art, including best practices, and scientific and technical progress in the field of pilot training. Accordingly, technical requirements and administrative procedures agreed by the International Civil Aviation Organization (ICAO) and the already developed requirements in Annex I (Part-FCL) to Regulation (EU) No 1178/2011 as well as the existing national legislation, pertaining to a specific national environment, should be considered and reflected by this set of rules taking into account the specific needs of General Aviation pilots in Europe. Member States that have established a national system for authorising pilots to fly in Instrument Meteorological Conditions (IMC) with limited privileges restricted to the national airspace of the Member State, and that can provide evidence that the system is safe and that there is a specific local need, should be allowed to continue to issue such authorisations for a limited period, subject to the fulfilment of certain conditions. Commission Regulation (EU) 965/2012 (3) allows certain flights such as cost-sharing flights and introductory flights to be performed in accordance with the rules applicable to non-commercial operations of non-complex aircraft. There is, therefore, a need to ensure that the privileges of pilots established in Regulation (EU) 1178/2011 are consistent with this approach. Therefore, it should be allowed to have flights of those categories identified in Regulation (EU) 965/2012 to be piloted by PPL, SPL, BPL or LAPL holders. Annexes I, II, III and VI are amended in accordance with the Annexes to this Regulation. Done at Brussels, 13 March 2014. (1) OJ L 143, 30.4.2004, p. 76. (2) OJ L 311, 25.11.2011, p. 1. (3) Commission Regulation (EU) No 965/2012 of 5 October 2012 laying down technical requirements and administrative procedures related to air operations pursuant to Regulation (EC) No 216/2008 of the European Parliament and of the Council (OJ L 296, 25.10.2012, p. 1). A student pilot shall not fly solo unless authorised to do so and supervised by a flight instructor. Applicants shall take the entire set of theoretical knowledge examinations for a specific licence or rating under the responsibility of one Member State. If an applicant has failed to pass one of the theoretical knowledge examination papers within 4 attempts, or has failed to pass all papers within either 6 sittings or the period mentioned in paragraph (2), he/she shall re-take the complete set of examination papers. Unless otherwise specified in this Part, flight time to be credited for a licence, rating or certificate shall have been flown in the same category of aircraft for which the licence, rating or certificate is sought. The privileges of the holder of an en route instrument rating (EIR) are to conduct flights by day under IFR in the en route phase of flight, with an aeroplane for which a class or type rating is held. The privilege may be extended to conduct flights by night under IFR in the en route phase of flight if the pilot holds a night rating in accordance with FCL.810. at the estimated time of arrival at the planned destination aerodrome, the weather conditions will be such as to enable the segment of the flight from an IFR-to-VFR transition to landing to be conducted in compliance with VFR. Prerequisites. Applicants for the EIR shall hold at least a PPL(A) and shall have completed at least 20 hours of cross-country flight time as PIC in aeroplanes. the flying training for a multi-engine EIR shall include at least 16 hours of instrument flight time under instruction, of which at least 4 hours shall be in multi-engine aeroplanes. Theoretical knowledge. Prior to taking the skill test, the applicant shall demonstrate a level of theoretical knowledge appropriate to the privileges granted, in the subjects referred to in FCL.615(b). Skill test. After the completion of the training, the applicant shall pass a skill test in an aeroplane with an IRE. For a multi-engine EIR, the skill test shall be taken in a multi-engine aeroplane. For a single-engine EIR, the test shall be taken in a single-engine aeroplane. By way of derogation from points (c) and (d), the holder of a single-engine EIR who also holds a multi-engine class or type rating wishing to obtain a multi-engine EIR for the first time, shall complete a course at an ATO comprising at least 2 hours instrument flight time under instruction in the en route phase of flight in multi-engine aeroplanes and shall pass the skill test referred to in point (e). An EIR shall be valid for 1 year. within 12 months preceding the expiry date of the rating, complete 6 hours as PIC under IFR and a training flight of at least 1 hour with an instructor holding privileges to provide training for the IR(A) or EIR. For each alternate subsequent revalidation, the holder of the EIR shall pass a proficiency check in accordance with point (g)(2)(i). If the EIR has not been revalidated or renewed within 7 years from the last validity date, the holder will also be required to pass again the EIR theoretical knowledge examinations in accordance with FCL.615(b). For a multi-engine EIR, the proficiency check for the revalidation or renewal, and the training flight required in point (g)(2)(ii) have to be completed in a multi-engine aeroplane. If the pilot also holds a single-engine EIR, this proficiency check shall also achieve revalidation or renewal of the single-engine EIR. When the applicant for the EIR has completed instrument flight time under instruction with an IRI(A) or an FI(A) holding the privilege to provide training for the IR or EIR, these hours may be credited towards the hours required in point (c)(2)(i) and (ii) up to a maximum of 5 or 6 hours respectively. The 4 hours of instrument flight instruction in multi-engine aeroplanes required in point (c)(2)(ii) shall not be subject to this credit. To determine the amount of hours to be credited and to establish the training needs, the applicant shall complete a pre-entry assessment at the ATO. The completion of the instrument flight instruction provided by an IRI(A) or FI(A) shall be documented in a specific training record and signed by the instructor. Holders of a pilot licence with privileges to fly sailplanes shall only operate a sailplane or a powered sailplane, excluding TMG, within cloud when they hold a sailplane cloud flying rating. a skill test with an FE qualified for this purpose. Holders of an EIR or an IR(A) shall be credited against the requirement of (b)(2)(i). By way of derogation from point (b)(2)(ii), at least one hour of dual flight instruction in a sailplane or powered sailplane, excluding TMG, controlling the sailplane solely by reference to instruments shall be completed. Holders of a cloud flying rating shall only exercise their privileges when they have completed in the last 24 months at least 1 hour of flight time, or 5 flights as PIC exercising the privileges of the cloud flying rating, in sailplanes or powered sailplanes, excluding TMGs. perform the additional flight time or flights required in point (d) with a qualified instructor. An applicant for a modular IR(A) course shall be the holder of a PPL(A) or a CPL(A). An applicant for the Procedural Instrument Flight Module, who does not hold a CPL(A), shall be holder of a Course Completion Certificate for the Basic Instrument Flight Module. The aim of the competency-based modular flying training course is to train PPL or CPL holders for the instrument rating, taking into account prior instrument flight instruction and experience. It is designed to provide the level of proficiency needed to operate aeroplanes under IFR and in IMC. The course shall consist of a combination of instrument flight instruction provided by an IRI(A) or an FI(A) holding the privilege to provide training for the IR and flight instruction within an ATO. An applicant for such a competency-based modular IR(A) shall be the holder of a PPL(A) or CPL(A). The course of theoretical instruction shall be completed within 18 months. The instrument flight instruction and the skill test shall be completed within the period of validity of the pass of the theoretical knowledge examinations. An approved competency-based modular IR(A) course shall comprise at least 80 hours of theoretical knowledge instruction. The theoretical knowledge course may contain computer-based training and e-learning elements. A minimum amount of classroom teaching as required by ORA.ATO.305 has to be provided. The method of attaining an IR(A) following this modular course is competency-based. However, the minimum requirements below shall be completed by the applicant. Additional training may be required to reach required competencies. A single-engine competency-based modular IR(A) course shall include at least 40 hours of instrument time under instruction, of which up to 10 hours may be instrument ground time in an FNPT I, or up to 25 hours in an FFS or FNPT II. A maximum of 5 hours of FNPT II or FFS instrument ground time may be conducted in an FNPT I. When the applicant has prior instrument flight time under instruction other than specified in point (a)(i), these hours may be credited towards the required 40 hours up to a maximum of 15 hours. In any case, the flying training shall include at least 10 hours of instrument flight time under instruction in an aeroplane at an ATO. The total amount of dual instrument instruction shall not be less than 25 hours. A multi-engine competency-based modular IR(A) course shall include at least 45 hours instrument time under instruction, of which up to 10 hours may be instrument ground time in an FNPT I, or up to 30 hours in an FFS or FNPT II. A maximum of 5 hours of FNPT II or FFS instrument ground time may be conducted in an FNPT I.
these hours may be credited towards the 45 hours above up to a maximum of 35 hours. When the applicant has prior instrument flight time under instruction other than specified in point (b)(i), these hours may be credited towards the required 45 hours up to a maximum of 15 hours. In any case, the flying training shall include at least 10 hours of instrument flight time under instruction in a multi-engine aeroplane at an ATO. The total amount of dual instrument instruction shall not be less than 25 hours, of which at least 15 hours shall be completed in a multi-engine aeroplane. To determine the amount of hours credited and to establish the training needs, the applicant shall complete a pre-entry assessment at an ATO. The completion of the instrument flight instruction provided by an IRI(A) or FI(A) in accordance with point (a)(i) or (b)(i) shall be documented in a specific training record and signed by the instructor. engine shutdown and restart (to be carried out at a safe altitude unless carried out in an FFS or FNPT II). have a minimum experience of at least 50 hours of flight time under IFR as PIC on aeroplanes. The content and duration of the pre-entry assessment shall be determined by the ATO based on the prior instrument experience of the applicant. the qualification of the flight simulation training devices as set out in the relevant requirements of Part-ARA and Part-ORA;’. The competent authority shall notify the Agency of the national administrative procedures, requirements for protection of personal data, liability, accident insurance and fees applicable in its territory, which shall be used by examiners when conducting skill tests, proficiency checks or assessments of competence of an applicant for which the competent authority is not the same that issued the examiner’s certificate. To facilitate dissemination and access to the information received from competent authorities under (a), the Agency shall publish this information according to a format prescribed by it. Date of issue and signature of the AME or medical assessor that issued the certificate. GMP may be added to this field if they have the competence to issue medical certificates under the national law of the Member State where the licence is issued. Material: Except for the case of LAPL issued by a GMP the paper or other material used shall prevent or readily show any alterations or erasures. Any entries or deletions to the form shall be clearly authorised by the licensing authority. Language: Certificates shall be written in the national language(s) and in English and such other languages as the licensing authority deems appropriate. The cabin crew attestation shall include all items specified in EASA Form 142 in accordance with items 1 - 12 as listed and described below.